Mozilla plans to roll out a number of changes in Firefox 64 that are extension related. The organization plans to roll out an update to about:addons that changes the design of the page. The redesign introduces a card-based interface but does not remove or change functionality on the page. The one downside to the new interface is that it requires more space to display the same information on the screen. Firefox users who experience display issues can zoom in or out of the page to display all options and information at once. Another extension-related change that Mozilla plans to introduce in Firefox 64 is the ability to remove any extension directly. Just right-click on any extension icon displayed in the Firefox interface and select the new “Remove Extension” option to start the process. Firefox displays a prompt when you select the uninstallation option from the context menu to verify that this is the desired action. Select the “remove” option to complete the uninstallation of the selected extension or cancel to keep the extension installed. Extensions can be removed on about:addons as well or by removing them directly from the Firefox profile folder. Google implemented a similar feature when it launched extensions support in Chrome years ago. Chrome users can right-click on extension icons and select “remove from Chrome” to uninstall extensions in the browser. Google Chrome displays a prompt as well to verify the action. The prompt includes an option to report the extension to Google. Firefox 64 makes extension installation notifications stick on the screen until the user interacts with the prompt. 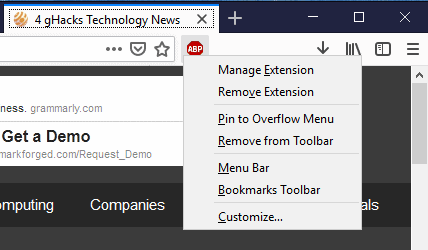 If you install a browser extension in Firefox 63 or earlier, you will notice that it goes away automatically when you navigate to another tab; this changes in Firefox 64 to make sure that users see the notification in the browser. The notification goes away when you close the web browser. Firefox’s Notification Permissions page highlights in version 64 if an extension controls the setting. The browser displays an option to disable the extension if that is not desired by the user. The ability to remove extensions directly from the Firefox toolbar is a much requested feature. It is useful to users who install and remove a lot of extensions, and in situations where users want to uninstall extensions quickly. The planned release of Firefox 64 is December 11, 2018. Now You: What is your take on the planned redesign and functionality change in Firefox 64?